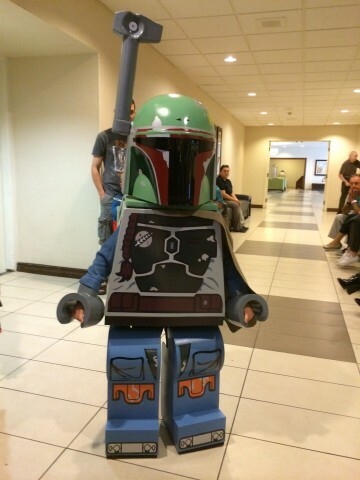 LEGO Boba Fett Costume « Adafruit Industries – Makers, hackers, artists, designers and engineers! I approached the components of this project as if they were actual Lego elements. In doing so, I created the jetpack to be removable as it appears in the actual minifigure as well as the range finder stalk. The entire costume is built from scratch using photo references and scans I took myself. The costume is built primarily out of sintra with pink insulation foam used to carve the helmet dome and a small amount of plastazote foam used on the tips and base of the jetpack rockets. Torso and leg graphics are printed on adhesive vinyl while a custom green was used to colour match the helmet and jetpack. All elements of this costume were approached the same way – photos, measurements, 2D drawings, scale, proportions. I used Adobe illustrator to hash out linear drawings of the helmet. Once I had the correct size of the dome, I was able to start. After a couple failed attempts at creating the dome with plastazote foam (making wedges to form the dome) I decided to carve it the old fashion way and simply used pink insulation foam from Home depot. Once I completed the dome, I began building the helmet using the antenna mount as my anchor point. I used a heat gun to shape and form the sintra, and glued layers to create the details throughout the helmet. After a few revisions ( the dark green concave section wasn’t deep enough and I had to redo it) the helmet was ready for bondo glazing putty. I use this to fill the seams and rough spots in order to achieve a seamless plastic molded look, much like a Lego minifigure. 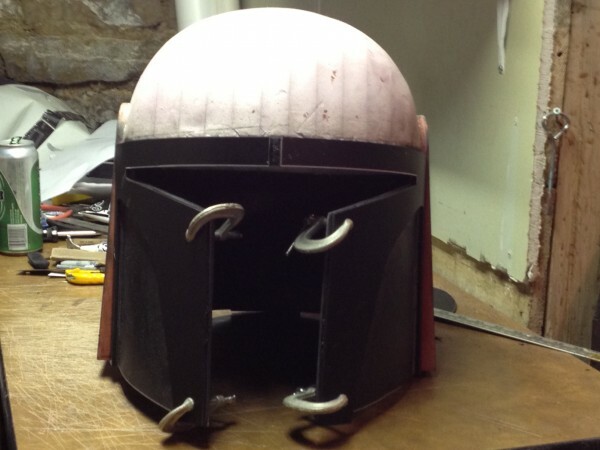 Read more about the build at The Dented Helmet.